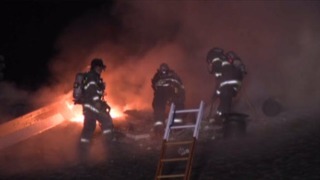 File image of San Mateo Fire Department crews. Embracing moments of silence to honor their fallen colleagues, public safety agencies calling San Mateo County home paid tribute to their fallen comrades Sunday morning in Belmont. The annual ceremony has been held for the past 15 years to commemorate the service and honor the sacrifice put forth by those professionals killed in the line of duty, according to a press released penned by Redwood City. Police officers, firefighters and paramedics working in the county were just some of those public safety officials on hand to read the names of deceased colleagues who have dedicated years of hard work to the region, according to the press release. Redwood City Fire Department Captain Greg Da Cunha has been leading the ceremony ever since his dear friend and comrade Matt Smith was killed in 2001, according to the press release. Sunday's recognition took place inside the Cunningham Memorial Chapel at Notre Dame de Namur University, according to the press release.